Is this day and age of online “garage sale” pages on social media, it’s easier than ever to connect with other people to buy their old furniture and household stuff. Unfortunately, sometimes you’re bringing home more than a new couch or bed, you’re bringing home hitchhikers. The worst of which can be bed bugs. They can be a nightmare to get rid as well as expensive. In this three part series we will explore how to tell if you have bed bugs or fleas, what exactly a bed bug is, how to get rid of them, if you rent who is responsible for getting rid of them and how to prevent future infestations. There are fewer things that can cause a household panic like waking up to find tiny, red bites all over you and your loved ones. While bed bug and flea bites may look similar, there are ways to tell them apart. The first thing you need to do is determine if you’re dealing with bed bugs or fleas. Both cause red, itchy bumps to appear but bed bugs have not been known to transfer any diseases to humans. Fleas can transfer diseases including typhus, plague and cat-scratch fever to humans, along with tapeworms. It can be difficult to see the difference between the two types of bites at first, but there are key differences to look for to see if you are dealing with flea bites or bed bug bites. Some people might have a stronger reaction to these bites so they can appear differently. You need to look at more than just the bites but it’s a good place to start and usually the first sign you’ll notice if you have a problem. Fleas are tiny, blood-sucking insects. Five percent of the flea population lives on pets, which is generally how humans get flea bites. Fleas can’t fly, but they can jump up to 18 centimeters. As soon as they latch on to a host, they begin biting. Flea bites cause a small red bump surrounded by a ring. Common characteristics of flea bites include being small light red bumps, itchiness, and are mostly found on your legs and ankles. These bites are extremely itchy and pop up quickly, in large quantities. Unlike other insects, fleas leave bites with only one puncture mark, not two. If you get flea bites, it’s important that you don’t scratch the area. The wounds can get infected and that will only increase the itching and could cause scarring. People often mistake bed bug bites for mosquito bites, other types of allergies or a rash. What you have to look for is a certain pattern of the bites. These types of bites are more red than flea bites, itch and often have a linear pattern. They often show up in a line like pattern with three to four bites at a time on the upper half of your body. They tend to bite people when they’re sleeping. This is because they’re attracted to your body heat and the carbon dioxide produced when you exhale. A 2012 study in Clinical Microbiology Reviews suggested although 40 pathogens have been found in bedbugs, they don’t appear to cause or transmit any diseases. Is it a Flea or a Bed Bug? Bed bugs are flat, seed shaped, reddish-brown and tiny. Look in the box spring and check for various sizes and stages, from bed bug eggs to adults. Varying size also applies to secondary signs of infestation. Eggs hatch in about six to 10 days and the newly emerged bed bug nymphs seek a blood meal. Immature nymphs molt five times (i.e., they shed their outer exoskeletons to grow) before reaching adulthood. They need to feed at least once before each molt, although they could feed as often as once a day. There may be three or more generations per year. They can live up to a year without feeding. 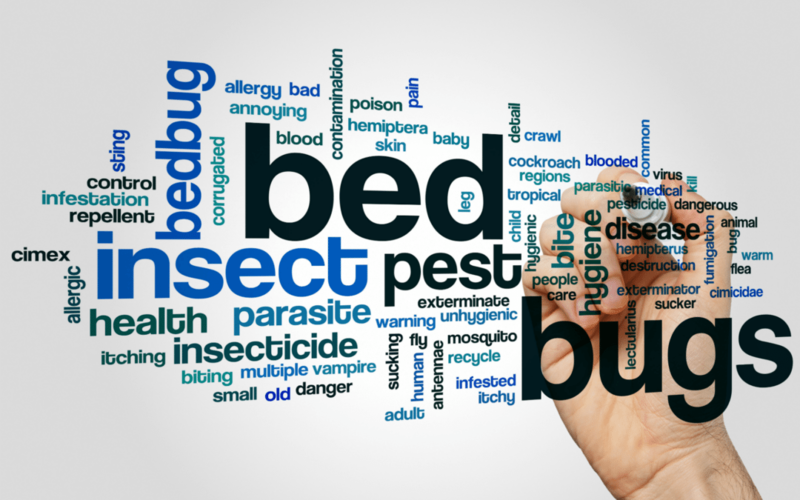 Carefully search beds and furniture for signs of bed bugs. Examine the areas beneath fitted sheets, along the edges of mattress and creases, around the headboard and any other tight, dark spaces. If no bugs or evidence of bugs are found, remove the mattress and continue with inspection of the box spring paying close attention to the four corners under the plastic corner guards and the on the underside of the box spring where the dust cover is stapled into the frame.Signs of a bed bug infestation include dark spots on bedding, eggs and eggshells (which are about 1mm across and white), and rusty or reddish stains on sheets caused by crushed bugs. Fleas have a more oval shape that appears skinnier and longer, rather than flatter. They range in color, but are typically a light shade of brown. A flea can jump vertically up to 7 inches (18 cm) and horizontally up to 13 inches (33 cm) which might make it look like they’re flying. Fleas are smaller than bed bugs, measuring one to four millimeters in length. They are usually easy to spot on your pets and they are active during the day where as bed bugs are normally not. Now that you’ve determined that you do in fact have bed bugs, what’s the next step? Who is responsible for the cost if you’re a renter? Most importantly, how do you get rid of them? We’ll cover all this in the next post, so don’t miss it!